A HOMETOWN FAVORITE THAT HOLDS A STRONG SENSE OF COMMUNITY IN SODO. 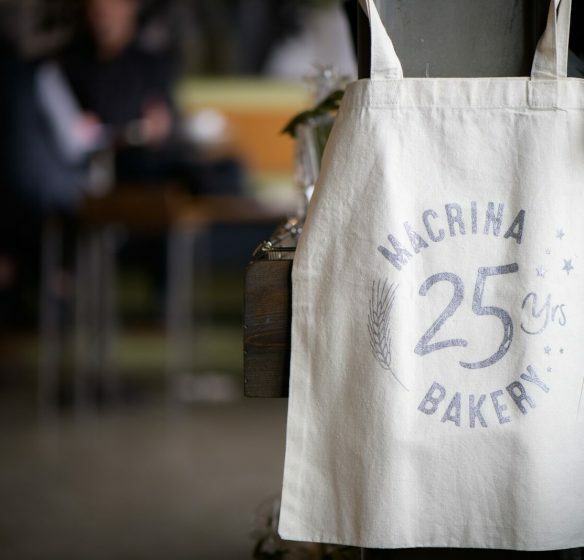 When Seattleites think of Macrina Bakery they know it as a hometown Seattle staple. The café, which first opened in Belltown, is filled with yummy pastries, tasty soups, fresh bread and one of the best weekend brunches. 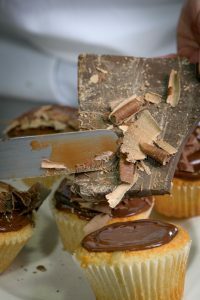 But now Macrina is more than just one café in Belltown, they have three locations throughout the city and one in Kent. Their food is also used in other Seattle restaurants, with the new popular fast food chain Shake Shack using a Macrina bun for one of their hamburgers. 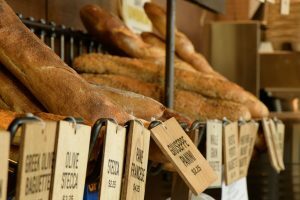 However, for the SODO community Macrina Bakery is more than just a café, it’s a place where the food brings the SODO community together- whether it’s for a breakfast work meeting, or two old coworkers turned friends catching up over lunch. 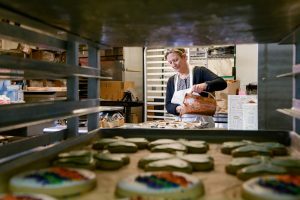 Leslie Mackie’s (founder of Macrina Bakery) love for baking started at a young age, as her Mom was always a foodie, and her Mom’s mom was a fantastic baker, who inspired Leslie to want to bake. Leslie remembers watching her Grandma and trying to memorize what she did, as none of her recipes were written down. Leslie has re-created some of her Grandma’s recipes at Macrina, including her favorite food item on the menu- the Roly Poly. This pastry is a unique take on the classic cinnamon roll adding coconut, walnuts, raisins and cream cheese frosting to create the most mouthwatering cinnamon roll you’ll ever taste. After high school, Leslie attended college and received a degree in restaurant management, and waitressed for several years. But she realized she wanted to be in the kitchen, so she left the front of the house to attend San Francisco’s California Culinary Academy. Once she graduated, she never left the kitchen, and fourteen years later the time was right to open her own business. She determined Seattle would be the perfect location, as she grew up in the Pacific Northwest, but with all the hills it felt like a mini San Francisco, which she loved. Thus, Macrina Bakery was born. Leslie opened Macrina’s Belltown location in the summer of 1993. 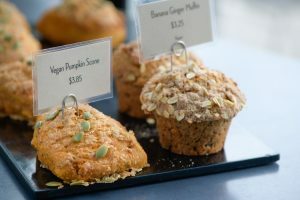 But by 2007, the Belltown location was running out of space, as the office, wholesale department and the café were all spread out across the neighborhood. 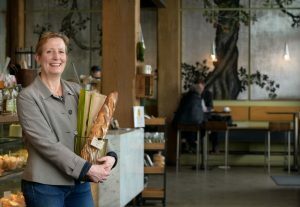 Leslie and her team of principle owners knew they needed to find a new building that allowed for all the departments to be in one location, while also keeping the Belltown café. During their search, one of the principle owners, Matt Galvin, came across the SODO location and thought it would be a good fit because it was accessible to the freeway and was a vital area in Seattle. The new space in SODO doubled the square footage they had in Belltown, giving them the ability to have office space, wholesale/production space and add another café. 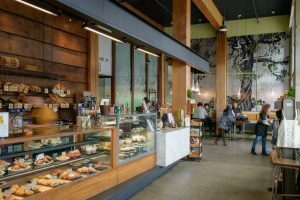 After opening the space in SODO, they realized just how great of a location it was, as there was a lot of commerce in the area and many employees came into the café for lunch. Unfortunately, in 2008 the recession hit, and Macrina needed to grow their sales department instead of just relying on sales coming to them. What started as a ten-year plan in SODO, turned into a four and half year plan, because once the recession ended sales boomed, which meant Macrina was growing out of the SODO location. Leslie said that before the decision was made to move, they tried to make the space as efficient as possible, upgrading equipment and streamlining processes. But the space was still too small, and she knew that she needed to move in order to gracefully expand production, without compromising the quality. The main production facility moved to Kent in 2016, though some items for the SODO café are still made on site. For Leslie, Macrina is a passion; she has a heartfelt connection to both her business and food and wants that to become an experience that transcends to the customer. Leslie loves SODO and how the combination of industry, commercial and retail converges together. She is committed to the SODO community, wanting to continue to serve the strong customer base that is here, with the hopes of enriching the community through the café. This is why Macrina Bakery is in SODO.